'Muhammad: Forty Introductions' Isn't Setting Out To Satisfy Michael Muhammad Knight's new book on the religious figure is designed to seduce, educate, and irritate its audience into curiosity about Islam and Muhammad — and on all three fronts it succeeds. Michael Muhammad Knight's Muhammad: Forty Introductions asks two questions at the same time — or asks the same two questions 40 times. That question is key to Knight's work. A convert to Islam, he has long written from — and for — the social and scholarly margins. His literary debut, a self-published punk novel called The Taqwacores, has become a cult classic. He's now a scholar and professor, and has written nonfiction about the Five-Percent Nation, Salafism, and meeting Muhammad's daughter while tripping on ayahuasca. In Muhammad, Knight draws from his massive variety of experiences. He listens to canonical voices and marginalized ones, studies traditions from across Islam, cites both Deleuze and Star Wars. Muhammad is as intellectually diverse as a book can get. Still, it's worth noting that Muhammad began in a Religious Studies department. While planning a college seminar designed to introduce primarily non-Muslim students to Muhammad, Knight grew frustrated by how many versions of the prophet he had to leave out. Should he introduce his students to Muhammad the military hero? The holy man? Muhammad as oral tradition? One introduction to Muhammad wasn't close to enough for Knight as a professor, or as a believer. He turned to the tradition of the arba'in, or forty-hadith collection. (Hadith are the narrative record of the sayings and doings of Muhammad and his companions.) Islamic literary history and pedagogy are filled with arba'in — why not write his own, offering forty introductions to the prophet? When Knight is in professor mode, Muhammad is perfect. He is scholarly but never dry, learned but never a show-off. He's superb at providing frameworks to fit new ideas in, and at helping readers reassess old ones. "When it comes to Muhammad," he writes, "we might lose hope of answering our question 'Who was the person?' but still ask, 'What was the event?'" The shift is a classic pedagogical tool, and an effective one. It's easy to imagine a classroom of rapt students writing it down. Muhammad's best chapters are the ones in which Knight not only writes as a professor, but writes about being one. In "The A'isha Question," he wrestles with how best to teach the story of Muhammad's marriage to A'isha, which took place when she was six and was consummated when she was nine. Islamophobes often take advantage of this story to "demonstrate" some essential wrongness in Islam. Knight refuses to allow that line of argument in his classroom, but he's a committed feminist and wants to talk about sexual consent. As a result, teaching A'isha's life becomes a massive challenge. Knight may not be confident he's gotten it right, but his chapter about trying is honest, rigorous, and empathic — the most we can ask from a teacher, or a writer. Knight is nearly as good when he writes specifically as a believer. Muhammad's second chapter, "Punk Rock and Bedouin Piss," is a perfect bit of religious memoir, introducing readers both to Muhammad and Knight through a hadith in which the prophet shows mercy to a Bedouin who pees in the mosque. Sixteen years after publishing The Taqwacores, Knight remains profoundly grateful for the Muslim readers — young and old, punk and decidedly non-punk — who "addressed me as their brother and welcomed me into their masjids and homes." By showing him kindness, those readers "reflected the practice of Muhammad, who did not fly into a rage when a Bedouin urinated in the mosque." Muhammad's problems arise when Knight can't pick a persona. When he fails to settle into personal writing but opts not to go academic, he flounders. In a socio-historical chapter on al-Fatiha, the first sura in the Qur'an, Knight writes, "Beyond its short and perhaps imprecise message, the Qur'an's opening also opens us to the Prophet." Unfortunately, he never quite tells readers how. Nor does he tell us why he finds al-Fatiha imprecise. As a result, the chapter itself feels fuzzy, both as an intellectual introduction to Muhammad and as a personal reading of the Qur'an. Occasionally, Knight's persona problems make him imprecise in bigger ways. Muhammad's chapters can seem disorganized, and Knight's tonal switches can be disorienting. In a chapter on the nature of God, Knight repeatedly refers to God as he — a very common choice, especially since the Qur'an uses male pronouns in Arabic. Still, given Knight's stated feminism and desire to be inclusive, it's a decision a reader might want him to explain. He does so 200 pages later, in an extended and beautiful riff on male representations of God. Why not put those two chapters side by side? Why not allow one idea to lead to the next, or allow a question to feed into its answer? A professor would. A memoirist, too. But in this book, Knight is neither. Muhammad: Forty Introductions is a highly personal project. It's valuable — and aggravating — for precisely that reason, which Knight knows. At the book's end, he writes that "assemblage also means fragmentation: the ingredients of my Muhammad often come to me as shattered pieces that have been chipped away from something else." He wants readers to find his introductions fragmented. He isn't setting out to satisfy. In fact, his goal is the reverse. 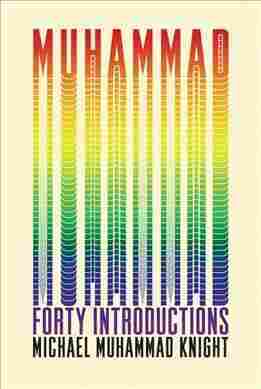 Muhammad: Forty Introductions is a book designed to seduce, educate, and irritate its audience into curiosity about Islam and Muhammad, and on all three fronts it succeeds. By the end, it's clear that 40 introductions are nowhere near enough. Knight's readers will want many more.